MANUFACTURER OF HAND OPERATED COOKIE MAKING MACHINE. BEST FOR SMALL AND MEDIUM BAKERS. CAPACITY TO GIVE 24 Doz. OF COOKIE PER MINUTE. WIDE SHAPES AND SIZES AVAIALABLE AS PER CUSTOMER REQUEST. Enriched with vast industrial experience, we export, manufacture and service provide to our clients an extensive range of Wire Cut Cookies Machines that are aknowledged fro durability and cutting edge technology. Our entire product range is in compliance with set industrial standards and quality. These products are aknowledged with adjustable speed and are configured with latest technologies. We are leading manufacturer of Instant cookies Machine. Mechanical Cookie Machine, Capacity: 80-120 Kg./Hr. - Computerized machine capable of producing upto 70 kg of cookies p/hr. - Different designs & shapes can be obtained by changing dies. - Indigenous machine, sturdy construction, perfect mechanism. - Different shapes & sizes of dies available as per customer’s requirements. Mechanical Cookie Machine is extruding the dough out to be cookies shapes. It can make various kinds of unique cookie shapes. with the features of advances technique, compact structure, multifunction, easy operation, etc. and it is the most popular and most ideal food machinery on the market. 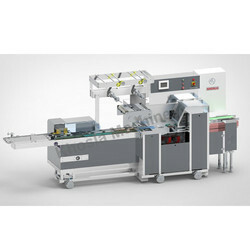 Our company is the foremost in offering Cookie Packing Machine to our clients. This product is manufactured by us is highly efficient for packaging cookies and keeping them crisp and fresh for a long time. 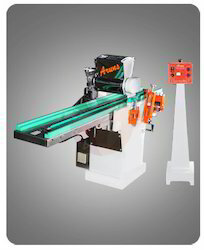 This product is available with auto and manual feeder for convenient operations & enables quick change over.